What was originally considered to be a minor injury has turned out to be anything but for Colorado Avalanche forward Matt Nieto. Just days after stating Nieto was “dinged up” and would miss Saturday night’s game, BSN Denver’s AJ Haefele relays news from GM Joe Sakic tonight that Nieto is expected to miss six to eight weeks with an undisclosed lower-body injury. The timeline leaves little to no chance that Nieto will return in the regular season. If the Avalanche make the playoffs, his availability would be in question through at least the first round, if not longer. It’s a tough blow for both the team and the player in what has been a career year for Nieto. The 2011 second-round pick has been nothing if not consistent over his NHL career as a bottom-six forward. Including this season, Nieto has recorded at least double-digit points in 58 or more games in each of his six seasons. His best year to date came in his sophomore campaign with the San Jose Sharks, when he registered 27 points in 72 games, although he nearly matched that total last season in Colorado. However, with 22 points already through 58 games this year, Nieto was on pace to finish the 2017-18 season with 30 points. This injury ensures that won’t happen, robbing Nieto of a new career best and the Avalanche of one of their top-nine scoring forwards. Fortunately, Sakic and company did manage to add Derick Brassard from the Florida Panthers at the deadline at a relative bargain rate and he will be in the lineup right away tonight when the Avs face those same Panthers. Even amidst a miserable season for the veteran forward, Brassard is a major addition for Colorado and should arguably be considered the best non-first line forward on the club the rest of the way. If he plays up to that expectation, he will more than make up for Nieto’s absence and could be the key to the Avalanche winning a playoff spot and Nieto seeing the ice again this season. Beyond Brassard, Tyson Jost, Sven Andrighetto, and Sheldon Dries are among the others who could be asked to step up in Nieto’s stead. The fate of the Avs’ season may rest in their ability to emulate their fallen teammate’s work ethic and tenacity on the ice. Early this season, the Colorado Avalanche were in the most enviable position in sports. Their team was excelling and looking playoff-bound, but without any negative effect on their draft status. Because as the Avs won games, the Ottawa Senators were losing them and Colorado owned the Sens’ first-round pick this year as part of last season’s Matt Duchene trade. There was a real possibility that the Avalanche could be Stanley Cup contenders and also have the first overall pick in the draft. Lately, the Avs have looked less like a playoff team and more like the Senators. Colorado has four wins in their past 23 games dating back to mid-December and have slipped into a tie for tenth-place in the Western Conference, three points out of a playoff spot. The one silver lining: their odds at drafting No. 1 have improved and might end up being the best in several years. Ahead of the 2014 NHL Draft, the NHL changed the draft lottery rules. Any team in the lottery could now move up into a top-three position and the odds would be more fairly distributed among all lottery teams. There have been slight variations in the odds for each draft, but the biggest shift came last year when the addition of the Vegas Golden Knights to the league added a fifteenth member of the lottery group and further split the odds. Yet, with 18.5% odds, the last-placed Buffalo Sabres still retained the first overall pick and drafted Rasmus Dahlin, a generational defenseman. This year’s prize, play-making forward Jack Hughes, is seen by most scouts as a guaranteed top-six center and power play wizard and the team with the worst record still stands the best chance of getting him by a significant margin. Of course, the worst record looks like it will belong to Ottawa and thus the pick will belong to Colorado. The Senators are currently in 31st overall in the league standings, three points back of the Los Angeles Kings and New Jersey Devils. If those standings hold, based on last year’s odds Colorado will have a 18.5% chance that the Ottawa pick will be first overall, compared to 13.5% for L.A. and 11.5% for New Jersey. Then, Colorado’s own pick comes into play. Currently, the Avs are technically 23rd overall. If they remain in that spot, they would have 5% odds that their own pick would be No. 1. Combined, they would have a 23.5% shot at picking first. Since 2014, no team has come close to having odds that high at the top pick and Colorado could continue to struggle down the stretch and improve the odds on their own pick. If the Avs were to slip three more spots in the league standings, their odds would be greater than 25%, giving them better than a one-in-four shot at Hughes. The possibilities are even more intriguing when you consider the odds of both picks winning the lottery instead of just one. Currently, there is about a 0.9% chance that Colorado could pick first and second, not dissimilar odds to those that the final lottery team has of picking first. The addition of both Hughes and the presumptive No. 2 pick, Finnish winger Kaapo Kakko, would be an enormous influx of elite draft talent unseen since the Sedin twins landed with the Vancouver Canucks at second and third overall in 1999. There is a whopping 58% chance that both of their picks land in the top four, which would also be an unbelievable boost for the Avalanche with a number of impact forwards available in this class. And again, these odds can only improve if the Avalanche continue on this downward spiral. If the current standings hold, the worst that Colorado could do is to pick fourth and twelfth – which would still be a better first-round combination than any team in recent years – and the odds of that happening are approximately 18x less likely than picking both first and second; the best case is greater reality than the worst-case. The moral of the story is that, while it’s disappointing for Avalanche fans to see a talented team plummeting down the standings, there is some upside as well. The team is young and built for the future and are in better shape than any team in recent memory to add the best player in the draft and perhaps two of the best available. So whether you’re a Colorado fan soley focused on Hughes or holding out for another top prospect as well, the team’s current slump is only helping in that pursuit. The ping pong balls will ultimately decide the Avs’ fate, but the future is bright. After another loss last night, the Colorado Avalanche are win-less in their last eight games. Normally, this would send a team plummeting down the standings, but in this season’s Western Conference “turtle derby”, the Avs are tied for tenth-place in the West and just four points back of a wild card spot with a game in hand on the Minnesota Wild. Colorado doesn’t have the best odds of making the playoffs – The Athletic model puts them at 32% – but they certainly still have a chance. It puts GM Joe Sakic in a difficult position as the NHL Trade Deadline approaches; he knows that his team, which held a playoff spot for much of the first half, has the talent to make the postseason, but he also lacks the confidence in the current standings to be a true buyer. Sakic stated last week that he would not move first-round picks or top prospects at the deadline, but without a win since then, he may have ruled out giving up any trade capital of value for a rental. Where a move does still make sense for the Avalanche is in acquiring a forward with term or team control. The lack of secondary scoring that has plagued the team this season is not going to magically correct itself next year, so it makes sense for Sakic to target forwards that could help down the stretch this year and moving forward. The best case scenario would be a deal where the Colorado does not have to give up futures to acquire such a player. Few of these opportunities exist, but the Avs are reportedly looking into one of them. Appearing on TSN 1050 in Toronto yesterday, Pierre LeBrun reported that the Avalanche are in on young Washington Capitals forward Andre Burakovsky. Burakovsky, 24, has fallen out of favor in Washington and has been on the trade block for much of the season. The talented winger is an impending restricted free agent this summer and due a qualifying offer of $3.25MM, but Colorado has both the cap space and the need for depth to accommodate a contract extension. Burakovsky, who is on pace for 24 points this season behind a drop-off in ice time and shooting percentage, has otherwise scored at a half point-per-game clip and logged strong possession numbers in his previous four years with the Caps. He could be the exact type of buy-low, high upside forwards that Sakic and company need. With a change of scenery, Burakovsky could make an impact this year and become a core piece for the Avs next season and beyond. Yet, what makes Colorado and Washington ideal trade partners is what the Capitals want in return. Like many contenders who are willing to move a young roster player, Washington will need a replacement. According to The Athletic’s Scott Burnside, the asking price for Burakovsky is another top-nine forward who can out-perform him in his stead this season. Washington GM Brian MacLellan has very little cap room to work with at the deadline – approximately $1.1MM in salary – and is almost exclusively looking to upgrade via hockey trade as a result. The Capitals’ best chance of improving at the deadline is likely in their return for Burakovsky. So what do the Avalanche have to offer as the centerpiece of a package for Burakovsky? Colin Wilson, an impending free agent with a cap hit just under $4MM, makes a lot of sense. Wilson has out-produced Burakovsky this season and brings an added element of experience and a hard-working style that would be a major boost to the Capitals’ bottom six. Matthew Nieto is another option; the 26-year-old has similar numbers to Burakovsky albeit with less potential, but does carry a team-friendly $1.975MM hit through next season. If the Avs are really high on Burakovsky, they may even consider swapping out one of their own RFA scorers in Alexander Kerfoot or J.T. Compher. Perhaps the most intriguing option though, and one that could likely up the price on the Capitals’ side, is veteran forward Carl Soderberg. After two down years, Soderberg is again on pace for a 50-point season and would be a major addition for the Caps. He does have a $4.75MM cap hit through next season that would require some retention on the part of the Avalanche, but if MacLellan is willing to sweeten the offer beyond just Burakovsky, Sodeberg could be a difference maker for the team. With good potential fits on both sides and rumored mutual interest, a Burakovksy-to-the-Avs trade could be coming down the line in the next twelve days. The excitement of the Edmonton Oilers’ signing of KHL goaltender Mikko Koskinen wore off quickly. As The Athletic’s Jonathan Willis points out, Koskinen’s $2.5MM cap hit on his one-year deal now looks like a major over-payment compared to a more recent deal for an import goalie. When the Colorado Avalanche signed Pavel Francouz yesterday, they got a better goalie for considerably less. Francouz’s deal with the Avs is also for one year, but for just $690K. Yet, Francouz was the best keeper in the KHL this year with a .946 save percentage and 1.80 GAA in 35 appearances for Traktor Chelyabinsk. With no disrespect to Koskinen, who was very good as well, the new Oiler had a .937 save percentage and split time with young Igor Shestyorkin, playing in just 29 games, yet will make more than triple what Francouz does next season. In fairness, Koskinen did have superior GAA this year (1.57) and has a small amount of NHL experience, but that does not totally make up for the $1.81MM difference between the two contracts. To add another layer, Francouz is also a younger and more athletic goalie than Koskinen and likely has a brighter long-term future in the NHL. Admittedly, the Oilers signed Koskinen first, so this could me more of a case of Colorado GM Joe Sakic getting his man for below-market value, but it seems more likely that it goes along with the trend of Edmonton GM Peter Chiarelli setting his sights on a player and not considering fair value or alternative options. Past results of these decisions have not worked out well for the Oilers, but we will have to wait for next season to see how the Koskinen signing pans out. In digging deeper into another recent transaction, today’s Marcus Kruger–Jordan Martinook trade has some scratching their heads. Given the team is currently operating without a GM, it is truly impressive that the Carolina Hurricanes seemingly came out on top in this deal in all aspects. Not only was Kruger available to the Arizona Coyotes for free earlier this year, but they gave up Martinook to get Kruger, who is much like a younger, better version of Kruger. The two forwards are both known for their two-way ability, but Martinook has 64 points in 239 games over the last three seasons compared to Kruger’s 44 points in 247 games over the past four years combined. At nearly 28 years old, Kruger’s career high in points is 28 with the Chicago Blackhawks in 2013-14 and he has never recorded double-digit goals, while the 25-year-old Martinook reached his career best of 25 points just last year, including 11 goals. Martinook has just as many 20+ point seasons as Kruger in only three full NHL seasons exclusively playing for the lowly Coyotes, while Kruger has spent almost his entire career with the dynastic Blackhawks. Defensively, Kruger does have the advantage of being a natural center who does well at the dot most years and is a positive possession player, but Martinook is far more physical and great along the boards, not to mention he has been the Coyotes’ best takeaways man since entering the league. Unlike past deals where the Coyotes took on a bad contract from another team in exchange for draft capital or prospects, Martinook will actually make less in salary than Kruger next season and even with the Hurricanes’ retention of a tenth of Kruger’s deal, the money essentially cancels out. So why make this deal? Arizona GM John Chayka must have a good reason, but on its face the only benefit to the Coyotes is a jump of 20-odd draft slots this June from the top of the fourth round to the middle of the third round. With many teams starting to see the writing on the wall that their season is coming to a close sooner than they had intended, the next question that comes about is whether the team has any intentions of making changes to their staff. After a look at possible changes to the coaching ranks, the next question would likely turn to which general managers are on the hot seat. The Athletic’s James Mirtle (subscription required) takes a look at 10 candidates who could find themselves without a job this offseason. Mirtle quickly addresses the obvious ones, including Detroit’s Ken Holland and Toronto’s Lou Lamoriello, both who have been rumored to either be on their way out or moved to a different role within the organization. However, Mirtle also admits that both could easily stay in their present roles too. The next stage of general managers that are most likely on the hot seat include Peter Chiarelli of Edmonton, the New York Islanders Garth Snow and Montreal’s Marc Bergevin, while other general managers might be given more time to prove to the organization that their plan works. Colorado’s Joe Sakic, Arizona’s John Chayka, Minnesota’s Chuck Fletcher and Columbus’ Jarmo Kekalainen are all likely to be on short leashes due to their inability of taking their teams to a new level. Helene St. James of the Detroit Free Press writes that while 2017 first-round pick Michael Rasmussen might make the Detroit Red Wings team next season, the real prospect to keep an eye on will be 2016 first-round pick Dennis Cholowski, whose having a stellar year with both the Prince George Cougars and the Portland Winterhawks of the WHL. The 20-year-old blueliner is in his final year of junior and has 14 goals and 50 assists this year. St. James writes that while Rasmussen must make the Red Wings roster out of training camp to stick, Cholowski could play with the Grand Rapids Griffins in the AHL and get a midseason callup if he can’t break into the Red Wings lineup. As the holiday season approaches, PHR will look at what teams are thankful for as the season nears the quarter point of completion. There also might be a few things your team would like down the road. We take a look at what’s gone well in the first month and what could improve as the season rolls on. Yesterday we examined at the Washington Capitals. What are the Colorado Avalanche most thankful for? A conclusion to the Matt Duchene saga. The hockey world has been all over the Avalanche and GM Joe Sakic for how they handled a trade request from one of their star players. Duchene wanted to get out of Colorado during a brutal 2016-17 season, but Sakic wasn’t willing to make a move until his high price was met. Earlier this month the bill was paid by the Ottawa Senators and Nashville Predators, and the unhappy Duchene can finally move on. Sakic needed to include a third team in the deal but eventually did get his reported ask of a young mobile defenseman, first-round pick and top prospect. In fact, he even added another prospect and two other draft picks to that total, coming away with quite the haul for a single player. Samuel Girard (the young defenseman) has flashed his top-pairing potential early, while Duchene has struggled to get on the scoresheet in Ottawa. Though it is far from decided, Sakic came out of a hard situation quite well after months of harsh criticism. Who are the Avalanche most thankful for? Overshadowed by the terrible record of the team, MacKinnon once again had a solid season for the Avalanche a year ago. With 53 points he easily led the team, and set career highs in shots and faceoff percentage. While nothing from last year’s Avalanche can be considered a positive, he at least wasn’t the anchor pulling the team down. This year is another story. MacKinnon, surrounded by a young more dangerous offensive squad is off to a tremendous start with 25 points in 20 games. That number puts him among the leaders in the league, and at the ripe old age of 22 there is still a legitimate chance his game could get even better over the next few years. Locked in at just $6.3MM per season through 2022-23, the Avalanche are in a prime position to build around their underpaid superstar with the next wave of talent. What would the Avalanche be even more thankful for? A return to form for Semyon Varlamov. In 2013-14 a 25-year old Varlamov played in 63 games for the Avalanche, recording a league-leading 41 wins and posting a .927 save percentage. That was good enough to earn him a fourth-place finish in Hart Trophy voting, while coming in just behind Tuukka Rask for the Vezina. Varlamov was an elite goaltender in the league and was rewarded with a five-year extension mid-season. Since then, his save percentage has dropped to an average .913 and sits at just .903 this season. While last year’s struggles can be explained away at least somewhat by injury, this year has shown him to be an average-at-best netminder in the league. A bounce-back to his previous highs would make the Avalanche an legitimate bubble candidate for the playoffs, if they aren’t already. 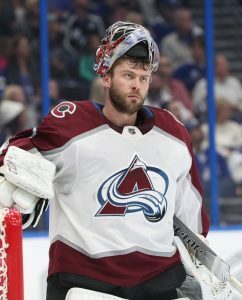 Varlamov has another year left on that extension after this season at $5.9MM, and will have to prove he can still be a starting goaltender in this league if he wants another contract with the Avalanche. What should be on the Avalanche Holiday Wish List? Even though the team has added Girard, brought over Andrei Mironov and drafted Cale Makar, there is still a shortage of NHL-caliber defenders in their system. 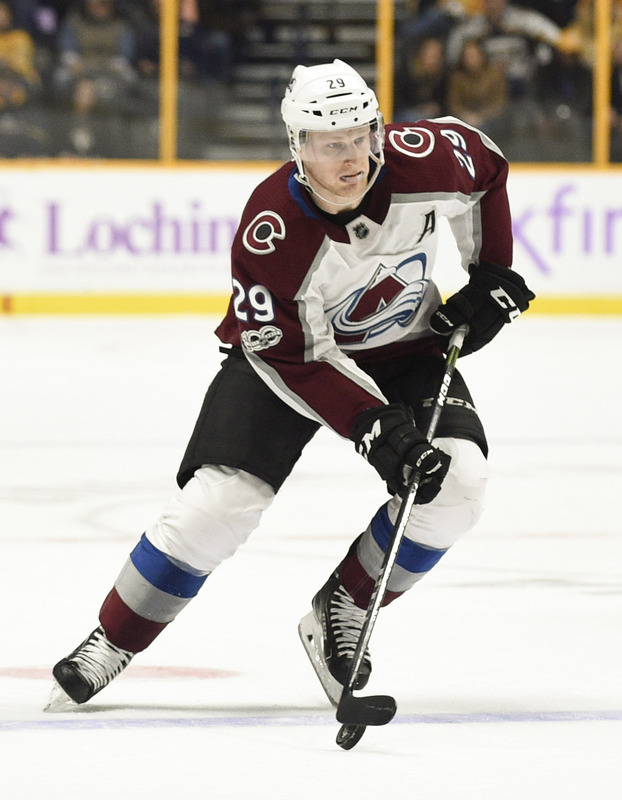 Nikita Zadorov fulfilling some of his potential would help, but the team will likely still be after other intriguing young defensemen on the trade market. With some interesting trade chips to use this season—there is no telling whether Gabriel Landeskog and Tyson Barrie are still on the market, but they weren’t part of Sakic’s “untouchable” group last year—the Avalanche could once again infuse some immediate talent into the back end.